50/50 blend of fluffy down and springy feathers creates a beautifully balanced pillow enjoyed in many of the world’s finest hotels. The traditional design gives you a high sink experience and cloudlike softness that adjusts as you reposition throughout the night. This is by far my favorite because it is soft yet supportive just enough. The 50/50 was the right mix for me. It is malleable and can be shaped a bit to get it just right. Awesome! Top hoteliers know that a well-balanced pillow ensures a great night’s sleep. Our Hotel Symmetry® Pillow is a harmonious 50/50 blend of fluffy Hyperclean® down and supportive Resilia® feathers. 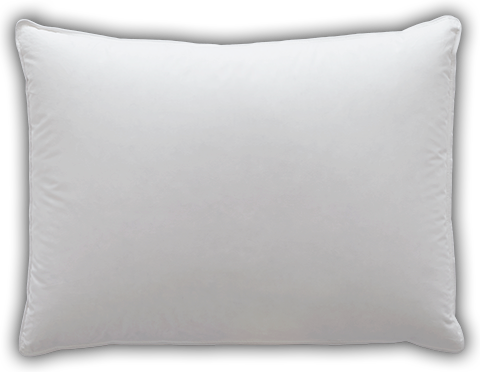 This soft support pillow satisfies sleepers no matter what position they sleep in each night. The traditional design is made of 230 thread count, 100% cotton with tailored white cording. Machine wash and dry this easy care pillow for years of enjoyment. We've specially blended an equal amount of Pacific Coast® Resilia™ feathers with our Pacific Coast® down for a balanced 50/50 fill. The combination of fluffy down and springy feathers give you a high sink experience with just the right amount of support.